Directory Submission is the Key to Strengthening Your Google PR & Increasing Your SE Rank! The Current Version is v4.0 loaded with more then 2700+ Directories and loads more features! Master Resale Rights Included, Limited Number Of Licenses! Do you really know what it takes to quickly generate high-quality traffic to your Web Site? We all know that generating traffic to a new website can be frustrating. I remember the days of checking my user status, only to find 10 or 15 hits per day. It seemed like such a slow, tedious process that I, frankly, did not have the patience for. Getting a new website on the map isn't easy! In order to be successful, you have to understand web development, search engine operations, linking campaigns, and of course, you need a marketing strategy. I can predict with strong conviction that with our software, your user status will triple or even quadruple in 60 days or less. But here is the best part we can offer you the complete software package for less than the cost of a reasonable website advertisement. Because of my background, I understand how much time, energy, and patience it requires to become a truly successful web developer. I have spent years studying every nuance of web traffic development technique that has come out and I still don't know everything there is to learn. But one thing I do know is that by submitting your website to high quality Link Directories your sites Link Popularity, Google PR and Search Engine Ranking will increase, thus will the number of visitors coming to your website and over all your online sales. Now I come to the other reason I created this website: to share the knowledge I have gained over the years. Starting your own website shows ingenuity, intelligence, and a sense of entrepreneurship. I'm happy to lend a hand to such a strong web-based community. I won't try to fool you. It wasn't easy, and I spent many frustrated nights trying to figure out what I was doing wrong. But once I learned the key ingredients to promoting a website, all of that hard work paid off. In a few moments, I'm going to tell you about the best way to generate targeted, consistent traffic every day. But before we get to that, it's important to understand the key concepts of search engine operations. If you know very little about link pop, Google PR, and reciprocal linking strategies, don't stress. We created Link Directory Submitter because we knew that the directory submission process could be made easier and more efficient. we also knew that by increasing the rate of directory submissions at such a phenomenal rate, our customers would have user numbers blowing through the roof! In essence, my partner and I took a process that is usually accomplished in MONTHS and whittled it down to something that can be done in a few HOURS. Instead of waiting months to generate sales on your site, you can start gaining the hits you want right now. Link Directory Submitter is the perfect solution for sending your sites to a multitude of pre-configured online directories. Link Directory Submitter comes with 2700+ link directories to submit to, more than half ranging from PR4 to PR7. Our directory submitter does not contain FFA pages or Link farms. Instead you will find specific, highly targeted directory sites just like DMOZ and many many more. · Create a profile (That is, the common data you usually have to repeatedly type by hand: your site address, link title, description, keywords, etc). This is a one-time process. · Select up to 10 directories at a time that you want to submit to from the list of over 2700+ directories along with a category/subcategory for your site. Link Directory Submitter will fill in all the other details. NEW FEATURE: Link Directory Submitter will now auto select the category for your website you are trying to submit if you have included them in your website profile. And even more power has now been put into your hands with the release of v3.0 of Directory Submitter. Here is a screen shot of the directory submitter software. By now I guess you are wondering: "Is this software really going to work?" Well we would like to offer you the chance to try it out, risk-free for 30 days. We could easily sell the software for $197, and it would be worth every penny at that price. And we may even raise it to that price in the near future. However we understand that not every webmaster has a huge budget to spend on software to help promote their websites. You'll increase your site popularity in record time. You'll receive more traffic by gaining a higher position in search engines, such as Google, Yahoo! and MSN. You'll stop wasting time manually submitting to link directories. You won't have to search for themed websites. 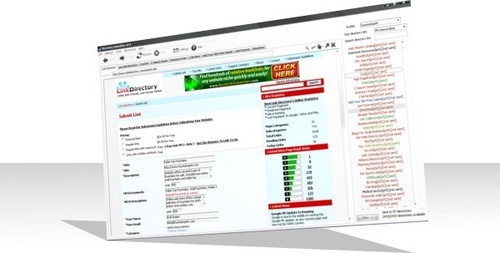 We now have more then 2700+ quality directories already included. You will greatly reduce your reciprocal links from your website because more then half the directories included in the software require NO back links to them. You'll cut down the number of directory rejections. You don't have to upload anything to your website. Everything is done from your desktop! You can submit ALL of your sites by using multiple profiles. The software is so easy, my 10-year-old niece whizzed through it in a matter of minutes! Each link directory in the submitter shows the directory's current Google PR. You get FREE lifetime updates to any new versions we release. You get fresh link directories to submit to by simply clicking the Update Directory Button from within the software, Each month we add between 50-100+ new directories into the submitter. The Link Title, Site Description and Keywords are rotated with each submission to a directory. This is to make each submission look as unique as possible from each other, and also to help get your website listed in search engines under many different keywords and link titles. Users can now assign a custom color to each directory in the submitter, this is useful if the user wishes to use a color coding system to keep track of submissions or anything else. A submission history report feature has been added to allow the user to export and email a submission history report to their clients or for their personal records. New Feature v2.4: Multi Tabbed Browsing - Run up to 10 browsers within the submitter which will greatly increase the submission process, because as you submit your website to one directory another directory will load in the other browser tabs and be ready for you to submit your website. New Feature v2.4: Category Auto-Completion. Enter one or more categories/subcategories for each site profile and Directory Submitter will auto-select the category for you on the submit page in your order of preference. New Feature v2.4: Alpha sorting of directories from A-z and Z-a also Pr sorting of the directory list. New Feature v2.4: Search option to find any directory in the submitter quickly. New Feature v2.4: Add comments to any directory in the submitter. New Feature v2.4: You can now add your own link directories into the submitter. New Feature v2.4: A reciprocal manager script fully integrated with Directory Submitter. It's now easier than ever to submit to reciprocal directories. Just click a button. New Feature v2.4-v3.0: 2700+ directories now and also a new database structure to increase the loading/refresh time when a user moves between filters and when using large directory lists (more than 5000 sites). New Feature v2.4: Auto Save, so you won't ever lose your submission history. New Feature v2.4: Auto Update Notice if there is a new version of Directory Submitter out or if there is an update to the directory database you will be notified. New Feature v2.4: Improved custom directory support and more configuration options and adding your directories is now easier than ever. New Feature v2.4: A directory database checker and PR updater integrated in the submitter. New Feature v2.4: You can now export/import your own custom directory database. You now also have access to brand new step by step video tutorials that will take you through every process of using the software, It could not be any easier. that shows you step by step how to use the software. New Feature v3.0: You can now manually mark a directory from the directory tree to Approved/Not Approved. New Feature v3.0: You can now sort the directory list by the directory status in the submitter. New Feature v3.0: You can now see the url of each directory from the list just by hovering your mouse over the directory. New Feature v3.0: You can now mark a directory in the submitter as broken if you find it has some issues at the moment. New Feature v3.0: You can now instantly see the Google PR for any directory and page on the directory with the new PR indicator that is found next to the url address window in the web browser in the software. New Feature v3.0: Added a 1 Click Fast access for editing your website profiles in the submitter. New Feature v4.0: All popups and java script error windows are automatically blocked. Plus you get unlimited email support for as long as you need it. I hope the information we have provided was helpful. I look forward to hearing about your success with Link Directory Submitter.